I am often asked what should be included in a Working Makeup Artists Kit. Q..Where does someone aspiring to become a MUA start? A..The first step to successfully start your journey is to have a fully functional kit that covers all global skin tones. 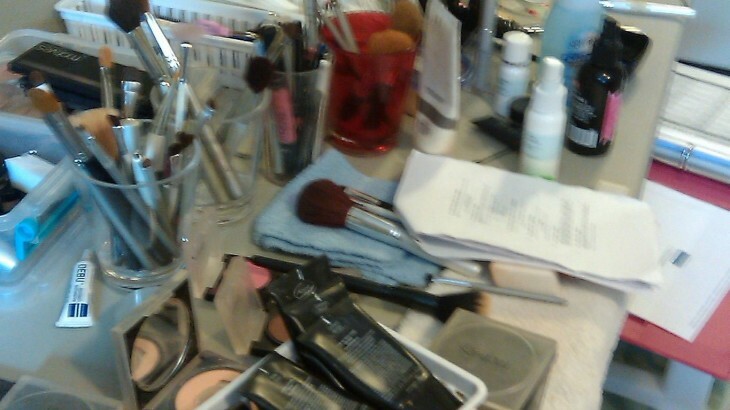 Q..Does an aspiring MUA really need all these types of products? A..Yes, if you don’t have a fully stocked kit with pro quality products then its not time to be charging clients yet. Q..Is it ok to just to stock my kit with things from the drugstore, $ store, or those $8 pallets off Ebay? A..There are always going to be some Gems that pros use and love that are drugstore, but the ONE thing you never want to skimp on is your foundation. You always want to use a good quality foundation that has been proven to hold up to the heat of professional lighting and has the pigmentation to work for Film, TV, or Photography. Q..I dont have much money to start with though, and we all start somewhere. A..Yes all the working pro artists did start from square one with our business. The operative word here is “Business” and what needs to be kept in mind is this is a business. You would not open a boutique dress shop with only a handful of dresses, or run to the thrift shop to stock it, why because that is not how a business is run. Here are the basics of what should be included in your Kit. Liquid Foundations – Adaptable for airbrush. Makeup makeup, makeup artist, makeup artist kit, mua, mua kit. permalink. YES YES YES YES YES YES YES YES YES YES YES YES!!!!!! Michele always with the dose of reality. It’s so important to invest in your kit at the beginning! Take your business seriously and start off RIGHT!